Polo shirt with approved logo. Polos purchased at other locations may be brought to school listed vendors for application of logo at minimal charge. Approved Spirit Wear* t-shirt, Palmetto Middle School Club/Sports shirts may be worn ONLY ON FRIDAYS. Capri Pants, pants or jeans. Shorts and pants must be worn at the waist. All shorts must reach the knee and pant legs may not drag on the floor. Shorts or pants may not have embellishment, embroidery, patches, holes or rips. Shorts and pants may NOT be athletic style (i.e. : basketball shorts, leggings, joggers, dry fit material or sweatpants). Approved colors: Solid Khaki, Black, and Blue Jeans. Solid color sweatshirt, sweater and/or jacket may be worn over uniform shirts in approved colors. Outerwear may not have embellishments, embroidery, patches, or holes. Approved colors: Solid Black and Grey. Sneakers or completely closed shoes. Caps, hats, headwear or hoods. Skirts, leggings, jeggings, sweatpants, dry fit material shorts, basketball shorts and joggers. Sandals, Crocs, high heels, house slippers. Any items not listed in approved sections. *Student ID’s provided MUST be worn at all times and cannot be altered in any way. *Failure to comply with the mandatory uniform policy can result in disciplinary action taken as outlined in the code of Student Conduct. 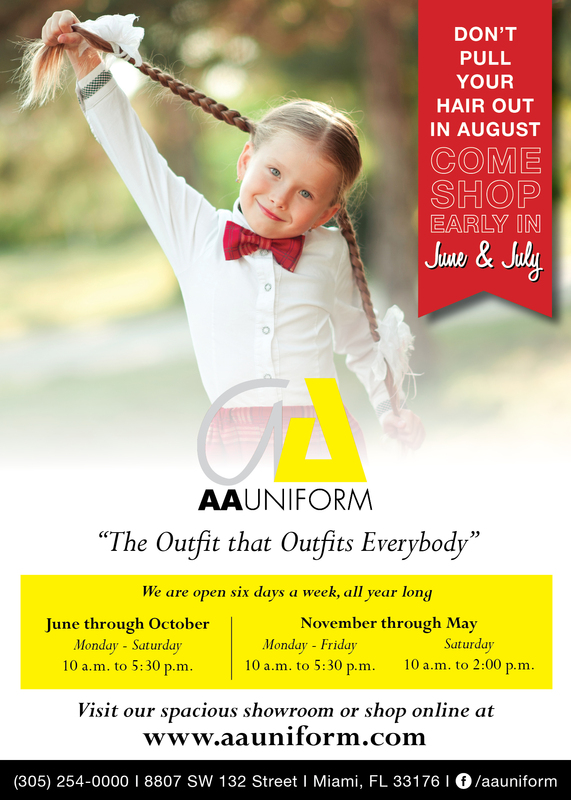 Should you have any questions regarding school uniform policies, please contact the school at 305-238-3911.